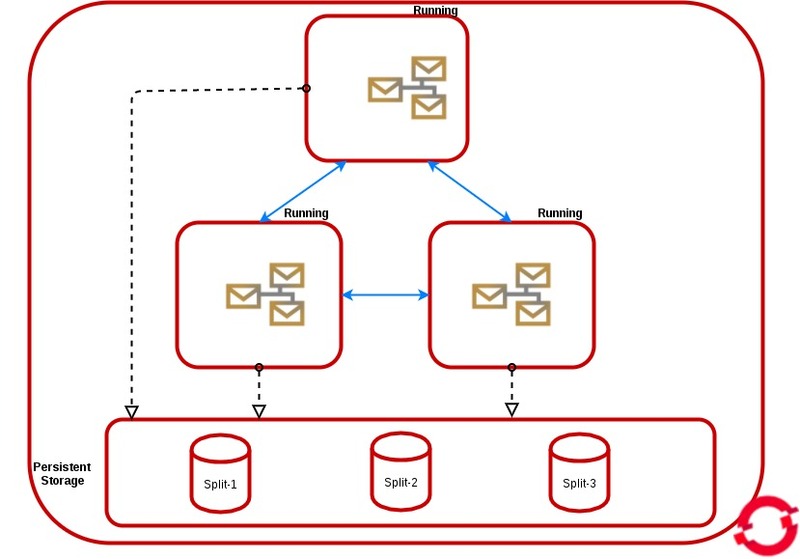 We can get this HA architecture by scaling a pod in persistent or non persistent storage. In the non-persistent mode, all instances don’t have a persistentVolumeClaim but they share the same service. In persistent mode, all instances share the same service and they have a persistent volume claim bound to the available persistent volume. 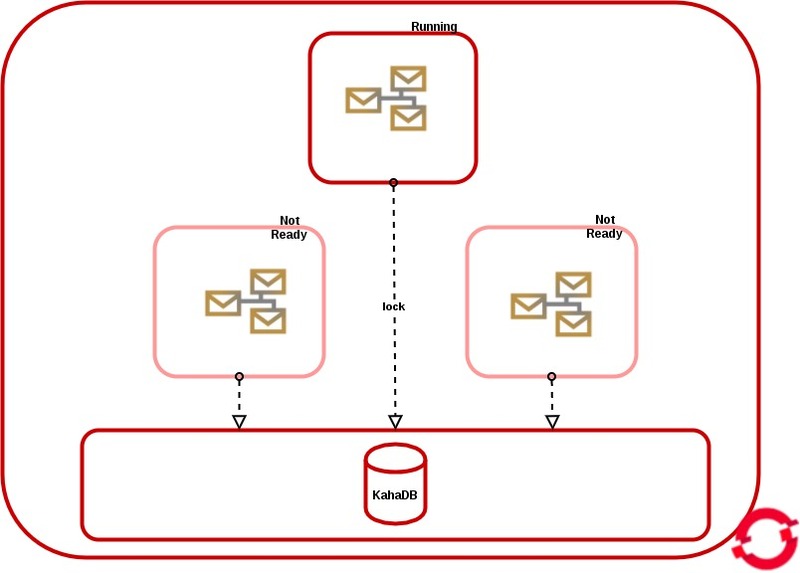 In both modes, the messages will be dispatched to the active consumer and the producers will be distributed across all of the available brokers, All the brokers will be discovered and automatically networked together in a mesh configuration, the discovery is based on the Kubernetes Service abstraction that you can configure also from the environment variable MESH_SERVICE_NAME. All the pods are in “Running status” and share the load. To realize this HA architecture, you only have to specify the parameter “AMQ_SPLIT=true” in the configuration. This will result in the server creating independent split-n directories for each instance within the Persistent Volume which can then be used as their data store. This is now the default setting in all persistent templates. The Master/Slave setup is realized only by setting the parameter “AMQ_SPLIT=false” in the configuration and only in persistent mode. The “master” instance gets the file lock and if we scale up, all the new pods will be in “Not Ready” status, and their brokers will be “slave” and polling until the lock is released. The rest of this post will be based on A-MQ Application templates, and especially on on amq-persistent-ssl template, since it’s the way to access to the broker from external clients via its SSL transports. Before we get started, you must create a persistent volume in OpenShfit and it should be in available status. You must create a set of keys to run A-MQ inside of Openshift. If you do not have an enterprise one, you can follow the steps below to create a set of SSL Keys. keytool -genkey -noprompt -trustcacerts -alias broker -keyalg RSA -keystore broker.ks -keypass password -storepass password -dname "cn=Abel, ou=engineering, o=company, c=US"
keytool -genkey -noprompt -trustcacerts -alias client -keyalg RSA -keystore client.ks -keypass password -storepass password -dname "cn=Abel, ou=engineering, o=company, c=US"
1. Connect to the OpenShift and query the address of the OpenShift route. Note the HOST of the route, in this example: amq63-amq-tcp-ssl-amq-demo.apps.redhat.com. 2. You should copy the three files broker.ks, client.ks and client.ts to your local computer. 3. Configure your JMS client to use broker URL as obtained from step 1 and use SSL keystore client.ks and trustore client.ts from step 2.